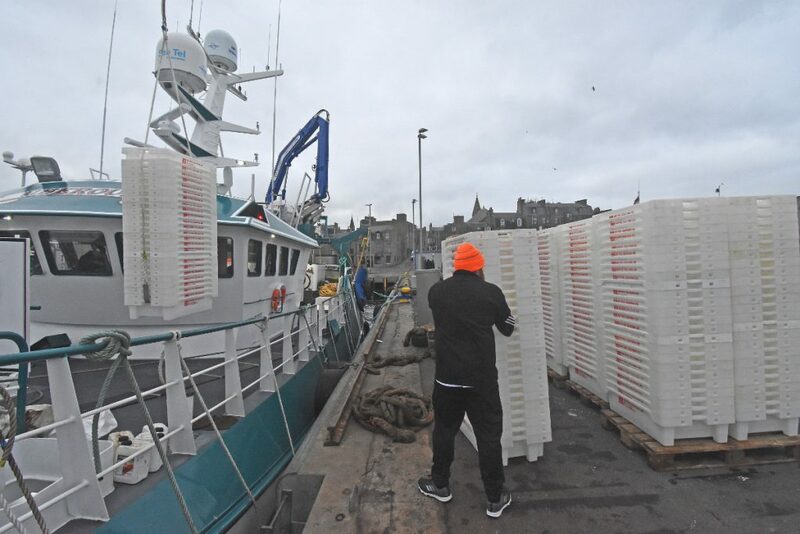 After completing the 200nm delivery trip from Whitby in 22 hours, Ian Duthie, together with relief skipper James Hadden and the crew, took aboard 500 BPS fish boxes and stores in preparation for Uberous’ first trip, while waiting in harbour for the vessel’s fishing licence and associated paperwork to be processed. 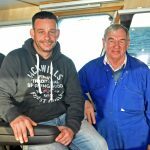 This provided an opportunity for a succession of family and friends to go onboard Uberous to wish skipper Ian Duthie all the best in his new venture. 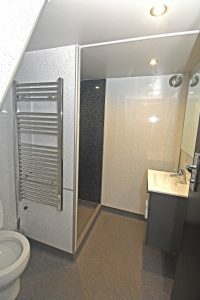 Those who looked over Uberous expressed highly complimentary comments about the standard of finish and craftsmanship evident throughout the boat. 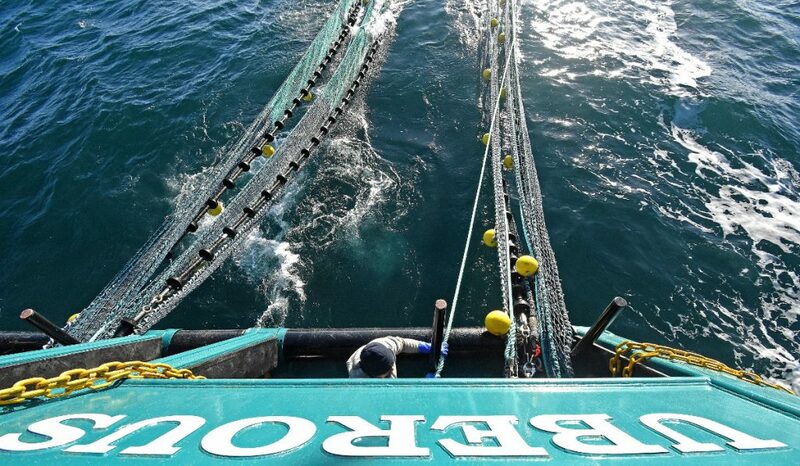 Hauling the 200ft letterbox twin-rig prawn nets, made by Faithlie Trawl, on fishing trials. The fully shelterdecked Uberous was built for Ian Duthie in partnership with his father Charles Duthie and Uberous LLP by Parkol Marine Engineering, and is the fourth new boat that the Whitby yard has completed in 2018. 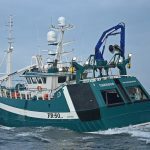 The new-build replaces her 13-year-old predecessor of the same name, which was bought by a Gardenstown partnership and renamed Zephyr BF 601 a few weeks ago. 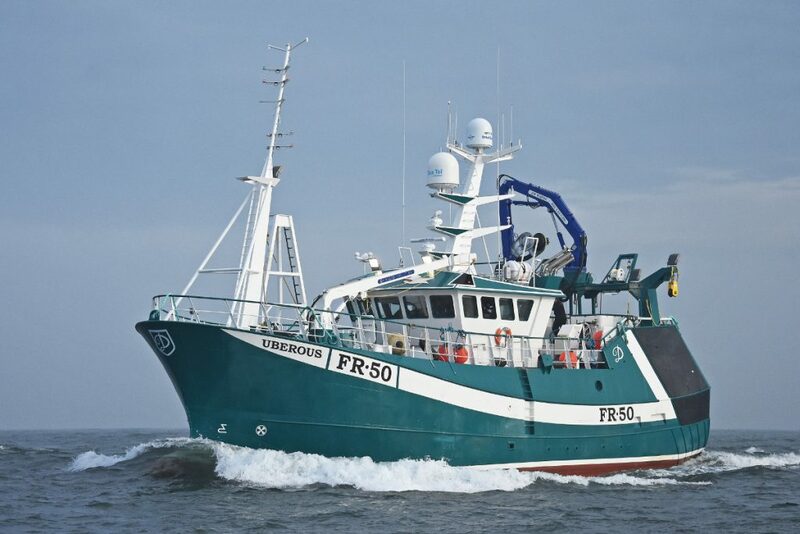 Insured by Sunderland Marine and working through Westward Fishing Company Ltd, Uberous is expected to work six/seven-day trips to the North Sea grounds before landing into Fraserburgh, where the vessel’s catches of prawns will be processed by the Scottish Fishermen’s Organisation. 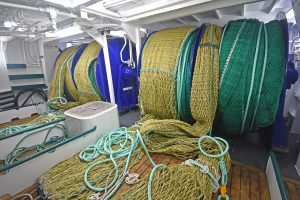 A number of Fraserburgh companies, including Blue Anchor Fire and Safety, Caley Fisheries, Faithlie Trawl, Fidelis Nets, McMinn Marine, Premier Refrigeration and Strachan Trawls, supplied equipment and fishing gear that Uberous is now starting to put to good use. Ian and Charles Duthie in Uberous’ wheelhouse. 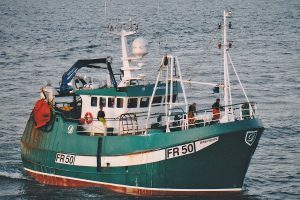 While returning to Whitby after completing fishing trials at the south end of the Shields prawn tows, skipper Ian Duthie said: “Uberous performed well on trials, and gave an encouraging initial indication of her capabilities for when we start fishing in considerably deeper water and poorer weather on our usual grounds. 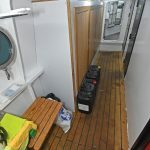 This will be the real test, and one I’m confident we will meet head-on in the next few months, when winter gales will probably provide ample opportunities for the boat to prove her seakeeping and fishing credentials. “At this stage, I’m delighted with the level of build quality and finish. A lot of people and companies have contributed to the end result, so sincere thanks to everyone for ensuring that Uberous is completed ahead of the date promised when the order was placed two years ago. Designed by Ian Paton of SC McAllister & Co Ltd, Uberous features a round bilge hull, the main dimensions of which are LOA 23.95m, registered length 22.92m, beam 7.8m, moulded depth 4.25m, draft 5m and GT 242t. In principle, while incorporating a number of subtle differences, the hull and working arrangements are generally similar to those of Daystar FR 86, which Parkol handed over to skipper Steven West in January 2017, although Uberous features a different centreline propulsion package. 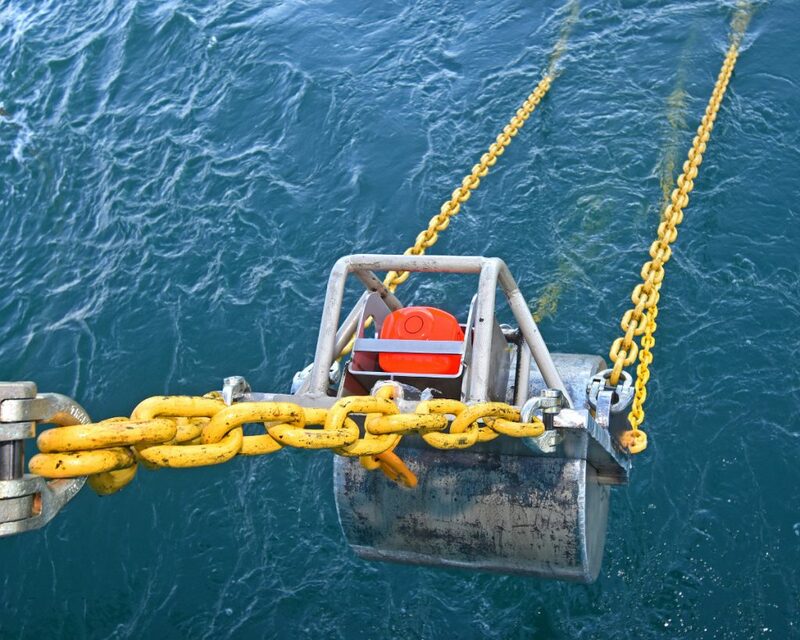 Gear-handling arrangements on the trawl gantry, where two auxiliary 3t Gilsons and the middle wire roller are positioned above a short banana towing bar. 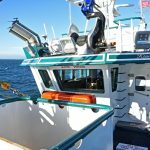 Particular consideration was given to the bow and underwater stern sections, from the differing perspectives of combining maximum deck space forward, load-carrying, and vessel trim throughout a trip, with propulsion efficiency and seakeeping qualities. The result is a full bulbous bow and fine waterline entry, above which there is a considerably concave raked stem and strongly flared bow section, to ensure that the vessel’s not inconsiderable 7.8m beam is carried well forward, while the aft lines sweep up to the transom. Forward, the flared bow shell plating blends stylishly into the traditional tumblehome shelter sides at the sweeping sheerline rail. The bold sheerline is a key visual signature mark of Uberous. Running from the customary main deck rail position aft, dipping at midships, to rise steeply to above the shelter at the bow, this resembles the wave crest/trough/crest profile of a boat at speed. Once the hull design was finalised, Deri Jones Associates generated the cutting information, which was then transferred to Holland for the cutting and forming of the double curvature shell plating, for subsequent delivery by road to Whitby. Uberous features a fairly conventional arrangement, with a watertight full-width bulkhead incorporated into the aft end of the steel deckhouse, separating the forward catch-handling area from the net-handling area at the transom. 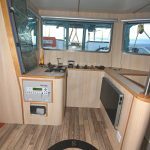 The watertight deckshelter is constructed with steel from the deckhouse aft to the transom, and from aluminium alloy forward. 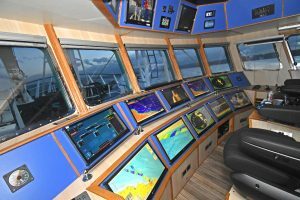 The main double-tier wheelhouse console. The wide connecting passageway in the deckcasing is offset to the port rail. 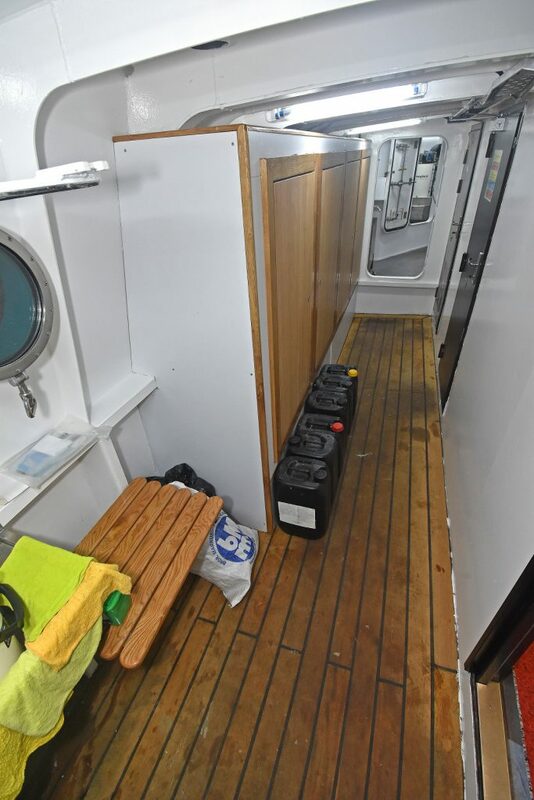 Individual heated oilskin storage lockers are arranged against the side of the hull amidships in this area, as well as bench seating and hand-washing facilities. 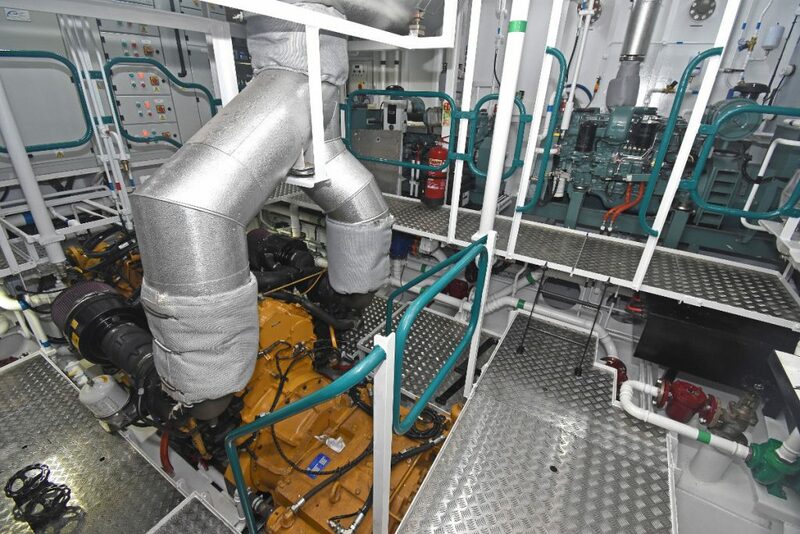 In addition to giving access to the quarter via the shelterdeck and an easy-access companionway, the main accommodation areas and the engineroom, the passageway also provides walk-in access to a general storage compartment located in the forward port corner of the casing. 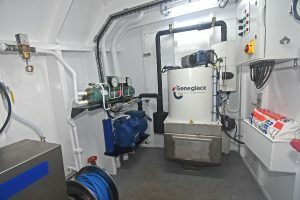 An additional bulkhead is fitted on the main deck forward of the catch reception hopper to create a dedicated winch compartment, the port side of which is extended towards amidships to provide a walk-in area housing a Geneglace 2.5t ice machine and a Nilfisk pressure washer, supplied by Grampian Power Clean. The catch-handling area is kept free of excess water from the fishwashers by two deck sumps drained by electrically driven Azcue pumps. 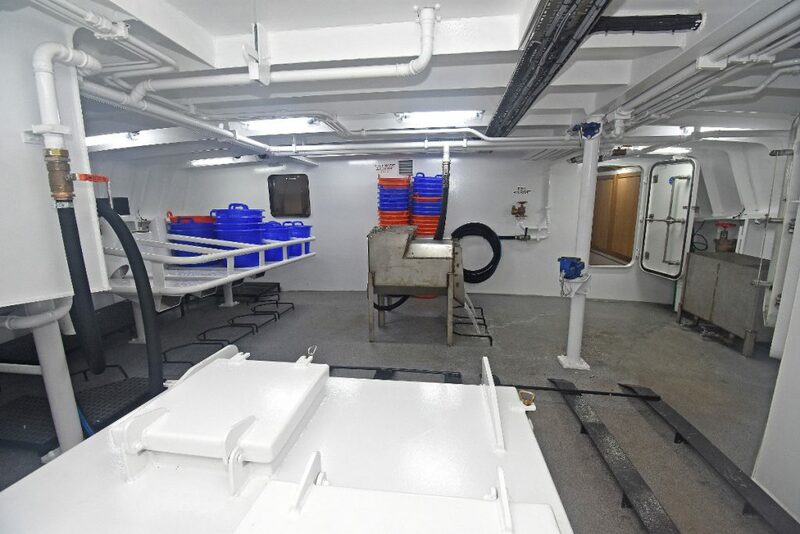 The catch-handling deck received specialist treatment from BPB Services of Fraserburgh, being coated with Degafloor hard-wearing non-slip resins. 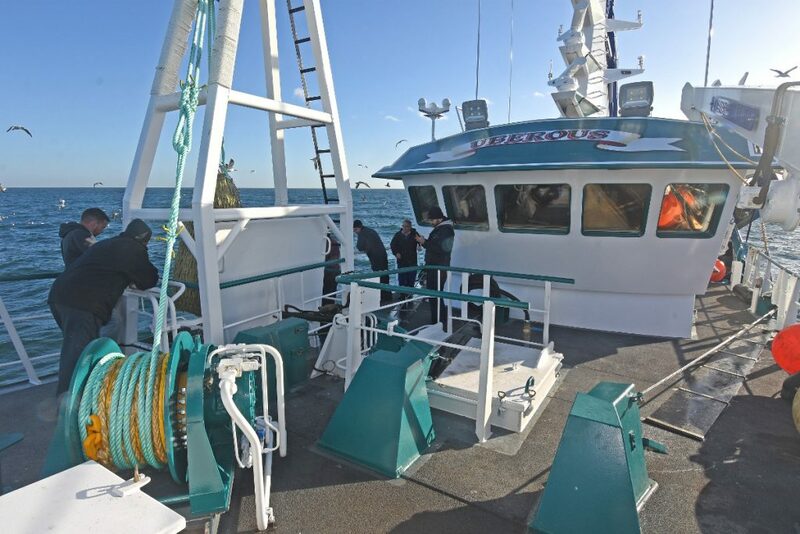 Skipper Ian Duthie opted for four-coat Degafloor resin compounds in which quartz aggregate stays suspended at the top surface of the coating to give high-adhesion properties, having heard good reports of its performance from a number of skippers. Working arrangements on the quarter. 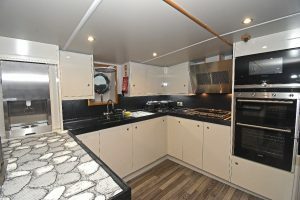 Arranged on the starboard side, the immaculately finished combined galley/messdeck features two smaller tables rather than a single bigger one, to provide maximum ease of access for the skipper and crew at all times. 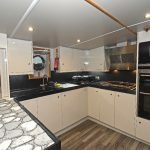 The modern galley, which features lighting under the elevated storage cupboards and grey planked flooring, is equipped with the usual range of modern electrical appliances. 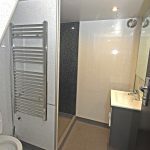 Separate washing and tumble-drying facilities are housed in the central passageway, aft of the shower/toilet room. 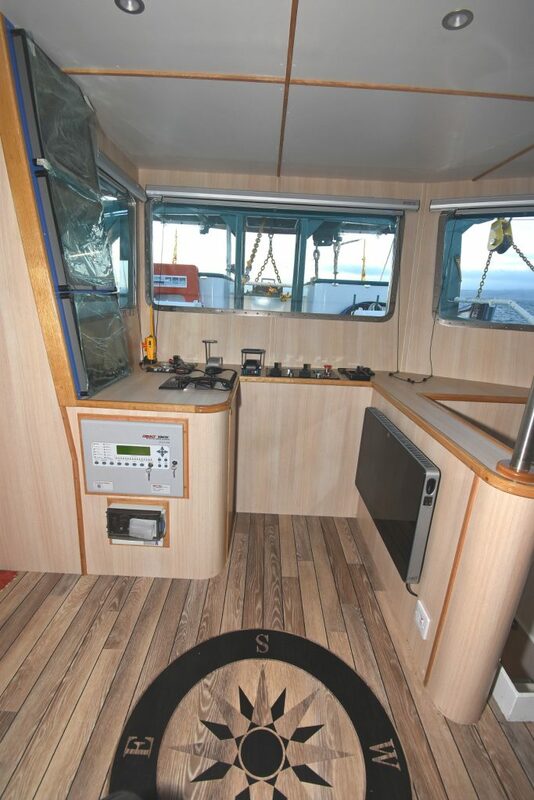 Below main deck level, the layout of Uberous from forward follows the accepted norm of forepeak and chain locker, thruster compartment, fishroom, engineroom and accommodation. The latter is neatly arranged to give four separate cabins. 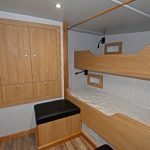 A single-berth skipper’s cabin is located forward of a two-berth cabin on the port side, while two- and three-berth cabins line the starboard side. 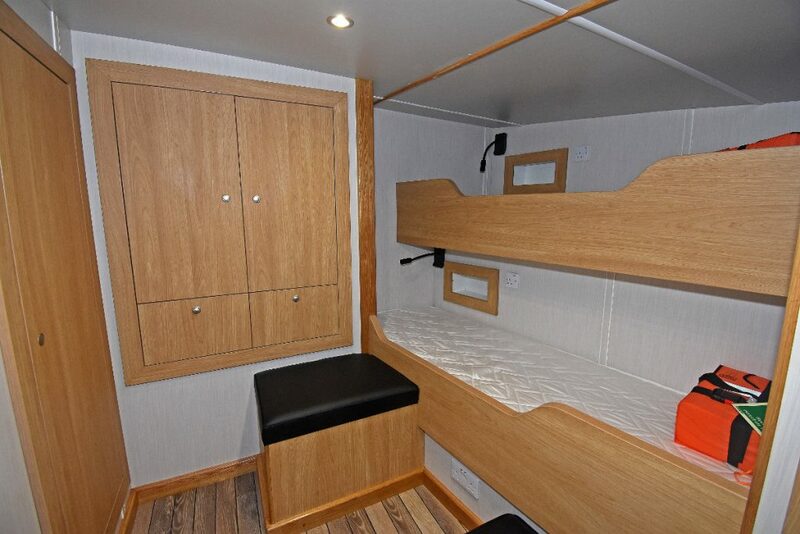 All internal accommodation areas on Uberous are finished to an extremely high standard, using a combination of solid timber and colour-co-ordinated modern materials to give an attractive and homely feel. 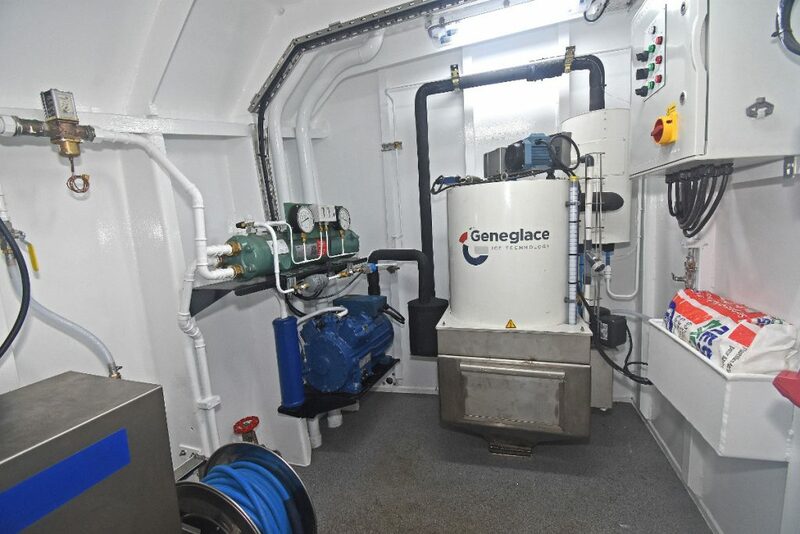 A 2.5t Geneglace flake ice machine was installed in a dedicated compartment on the main deck by Premier Refrigeration of Fraserburgh, which also fitted chilling to the deck and bulk heads in the fishroom. 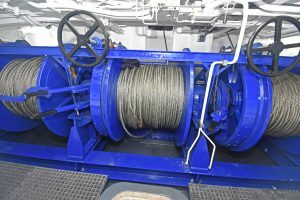 Manufactured by EK Marine Ltd of Killybegs, layout of the deck machinery package on Uberous closely mirrors conventional arrangements. 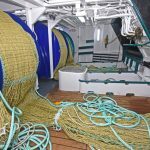 Fishing activities are focused on a three-drum trawl winch, positioned forward on the main deck in a separate winch room. Rated 35t core pull, the winch is fitted with two-speed drive motors for faster hauling and shooting of the wires. The winch barrels are spooled with 250 fathoms of 22mm-diameter fibre-core wire supplied by Karl Thomson of Buckie, plus 50 fathoms of backing wire. Led up from the drums at nearly 45° to hooded rollers, the outer wires run across the top of the shelterdeck to a second set of sheaves, positioned near the sides of the shelterdeck near the aft corners of the wheelhouse, from where they are directed upwards towards hanging blocks mounted on a conventional trawl gantry. 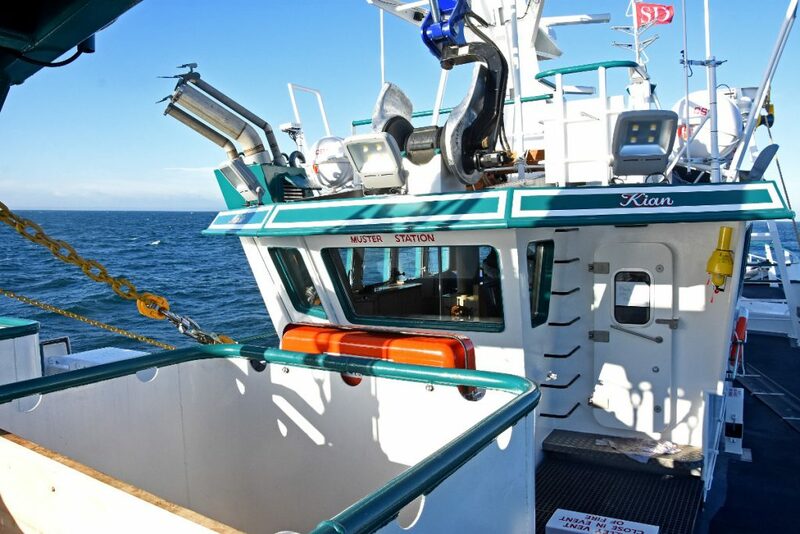 The middle wire runs slightly to starboard under the wheelhouse floor, before leading upwards to pass over a roller incorporated into the trawl gantry, directly above a secure track for the safe storage of the middle roller. 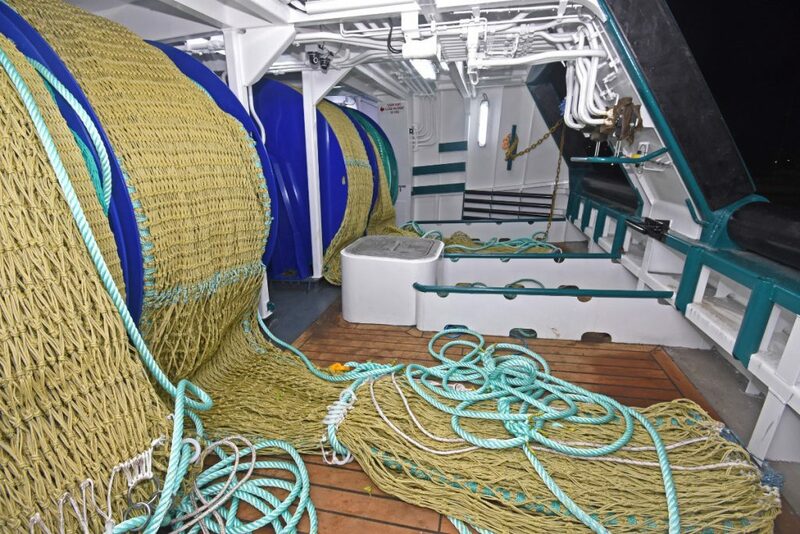 Two sets of 2 x 12t split net drums are arranged side by side on the hardwood-decked quarter in line with the customary transom shooting and hauling hatches, the lower edges of which are fitted with large-diameter free-turning rollers. 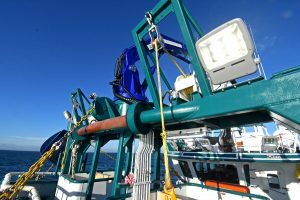 A 1.5t @ 7.8m kinked-boom crane, fitted with a Thistle 24in W-sheave powerblock, is centrally fitted atop the trawl gantry. 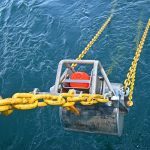 Two general-purpose 3t Rotzler gear-handling winches are fitted on either side of the crane, to give further options when working twin-rig trawls and dealing with boulders and other fraps. 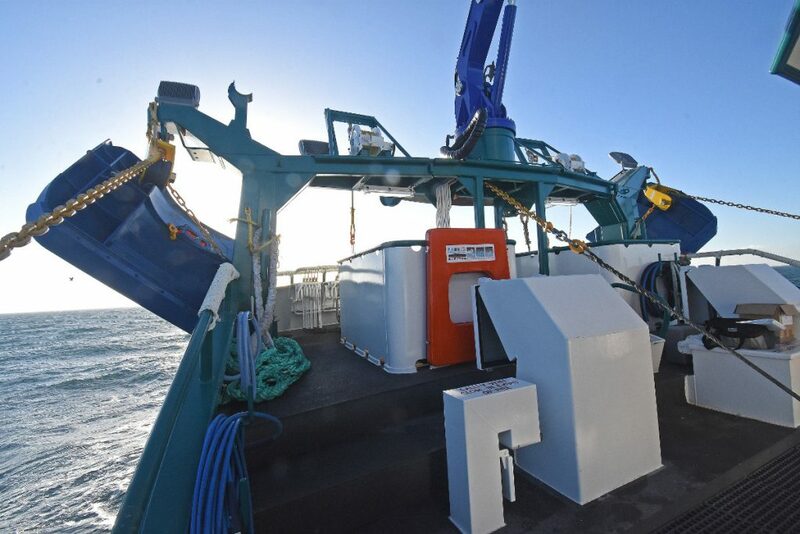 The codends are taken aboard forward on the starboard side by a 7.5t Gilson winch mounted on the foreside of a square-framed lifting gantry, arranged over a hydraulically operated hatch and a large-capacity reception hopper. 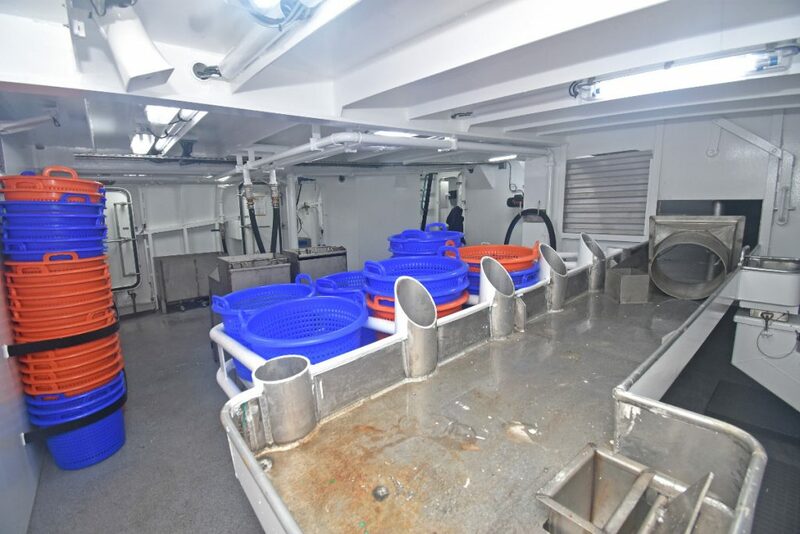 … forward of the galley on the starboard side. All the necessary Flemings Fairleads hanging blocks and deck rollers were manufactured by F&R Belbin of Tynemouth. After being released from the codend into the hopper, the catches are gravity-fed onto an elongated sorting table that extends aft. 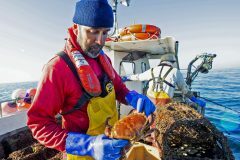 Standing with their backs against the starboard side of the boat, the crew sort and gut the catch off the table. 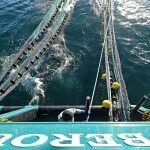 Selections are placed in elevated baskets, while prawn tails are directed into baskets on the deck via separate chutes. 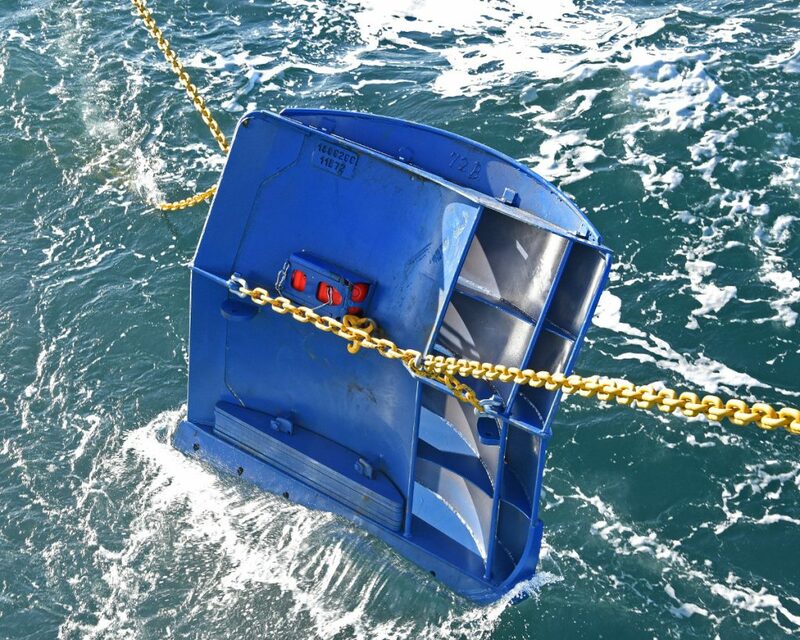 Twin prawn/whitefish washers are positioned on the vessel’s centreline, adjacent to the sorting area. A rectangular prawn dip tank is positioned to port. 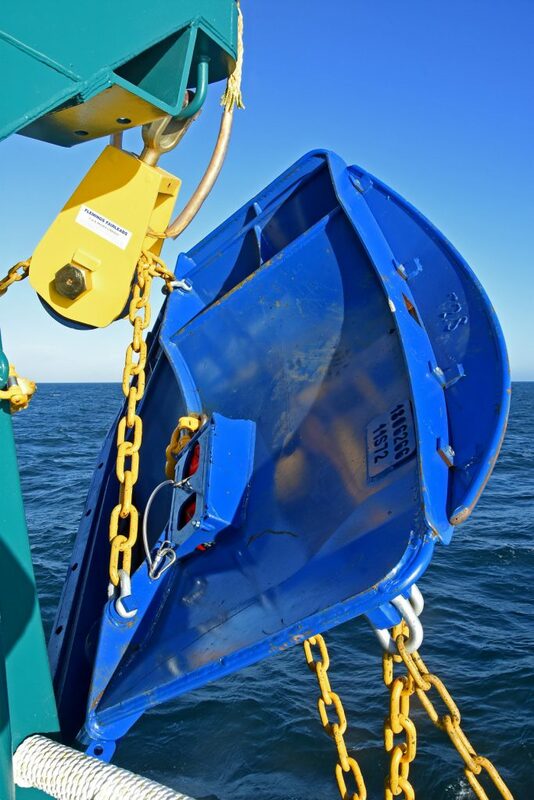 Spare baskets are securely stored against the forward bulkhead of the deck casing. 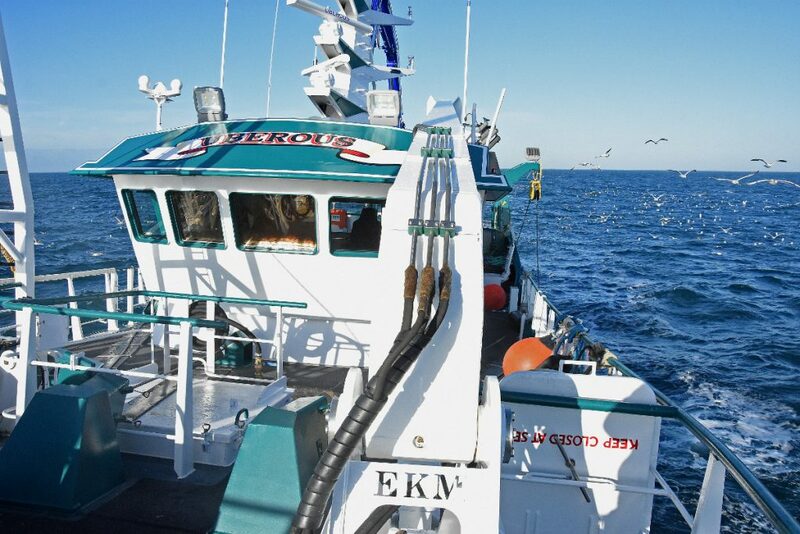 On being lowered by basket down to the fishroom, catches are weighed and labelled using a set of electronic Marelec W50/D41 motion-compensated electronic scales, from which the data is transferred to the wheelhouse for subsequent reporting by the skipper, using an E-catch logbook. 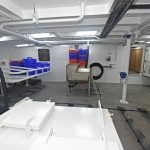 Capable of holding 450 stacker boxes in four tiers aft of the hatch, the fishroom has a working capacity of approximately 800 boxes. Five hundred boxes are usually taken onboard at the start of a trip. 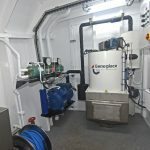 Up to 5t of flake ice can be stored in a full-height locker on the port side, directly under a 2.5t Geneglace flake ice machine, housed in the dedicated refrigeration plant room on the main deck. 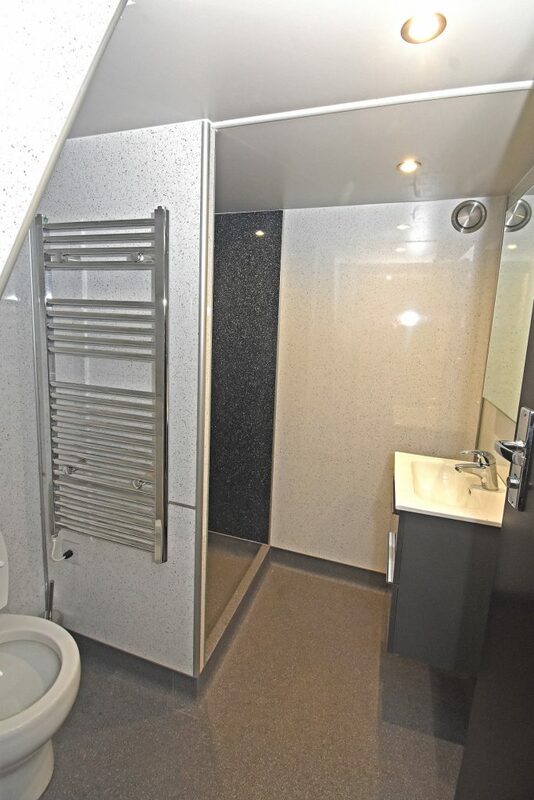 … which also houses the shower/WC room. 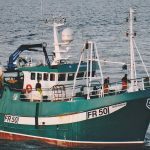 In order to ensure that catches are landed in optimum condition, Premier Refrigeration Ltd of Fraserburgh fitted chilling to both the forward and aft bulkheads, as well as the deckhead. The copper chilling pipes fitted to the vertical bulkheads are protected by stainless steel sheeting. Stainless steel 22mm-diameter piping is mounted on the deckhead. 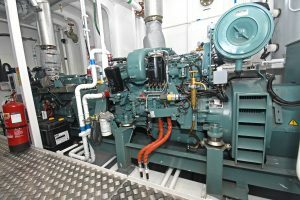 Automatically controlled from the wheelhouse, and set to the required temperature by a digital thermostat, the cooling plant comprises a Bock compressor, an Azcue water pump driven by a three-phase electric motor, and a Blitzer seawater condenser. The bilges under the fishroom floor are served by an automatic pump. Catches are discharged from the fishroom using an EK Marine 1t x 8m straight-boom crane fitted with a 1t landing winch. 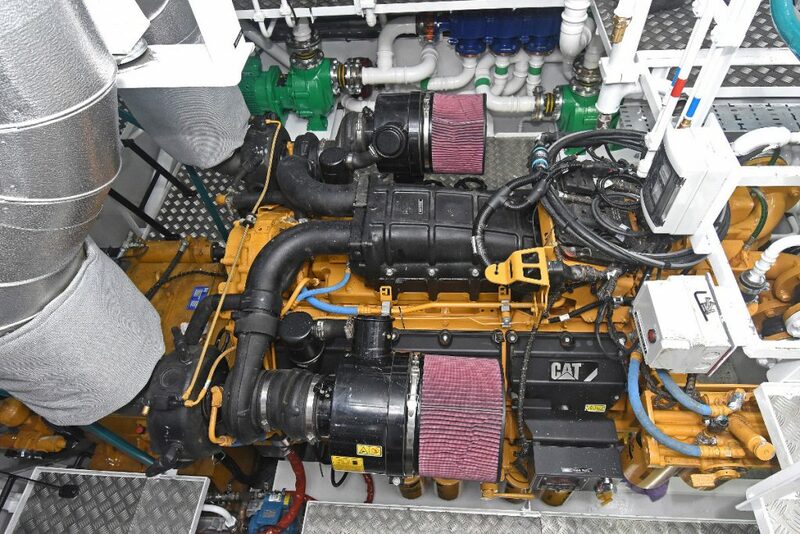 Uberous is powered by a Caterpillar C32 ACERT main engine, supplied by Finning UK Ltd. The rationale for this lies in the fact that the electronically controlled engine, which itself delivers improved fuel efficiency, features a wide operating speed range (WOSR) to deliver a flat power curve. This means that the engine can deliver full power while running at 1,600rpm to 1,800rpm, thereby enabling the large propeller to turn more slowly and provide enhanced propulsion efficiency. 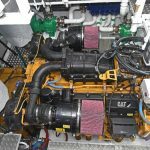 Two Mitsubishi 6D16T auxiliary engines drive 100ekW Newage Stamford 415/3/50 generators. Developing 494kW @ 1,800rpm and solely dedicated to propulsion duties, the main engine drives a 2,500mm-diameter four-bladed fixed-pitch Wärtsilä propeller, turning in a matching Wärtsilä fixed nozzle through a Masson Marine 9.077:1 reduction gearbox. 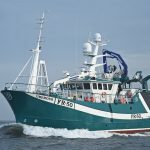 Engine and fishing trials demonstrated encouraging results with the stern gear, which was machined by Premier Engineering of Scarborough and is fitted with Deep Sea Seals, delivering a very smooth and quiet performance in all operating modes, and strong towing performance. 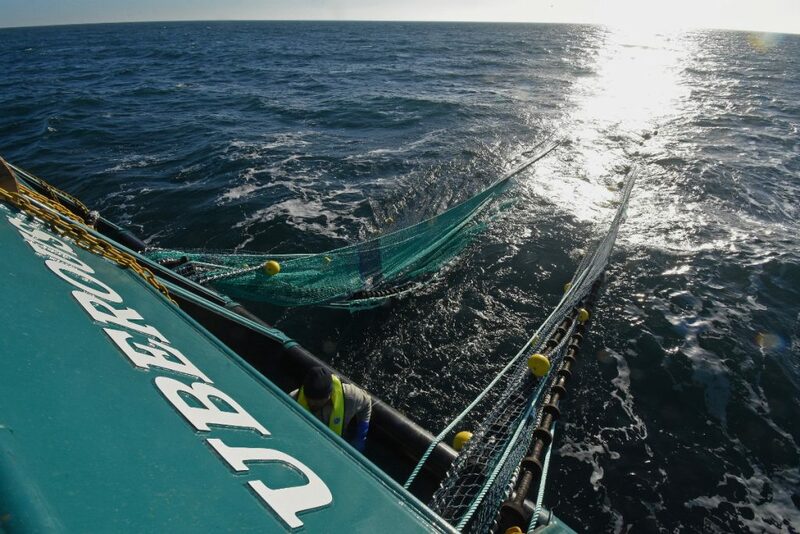 The centreline combination, together with a single rudder, gave Uberous an average speed of 10.5 knots on sea trials. 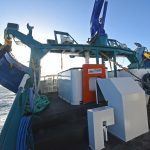 Perhaps more importantly for a vessel that will spend more than 80% of its time at sea towing, the propulsion system returned initially encouraging low levels of fuel consumption on fishing trials, when Uberous was using around 50 litres an hour, towing 200ft letterbox twin-rig trawls before the tide at three knots in 35 fathoms of water at 1,250rpm, with a door spread of 72 fathoms. 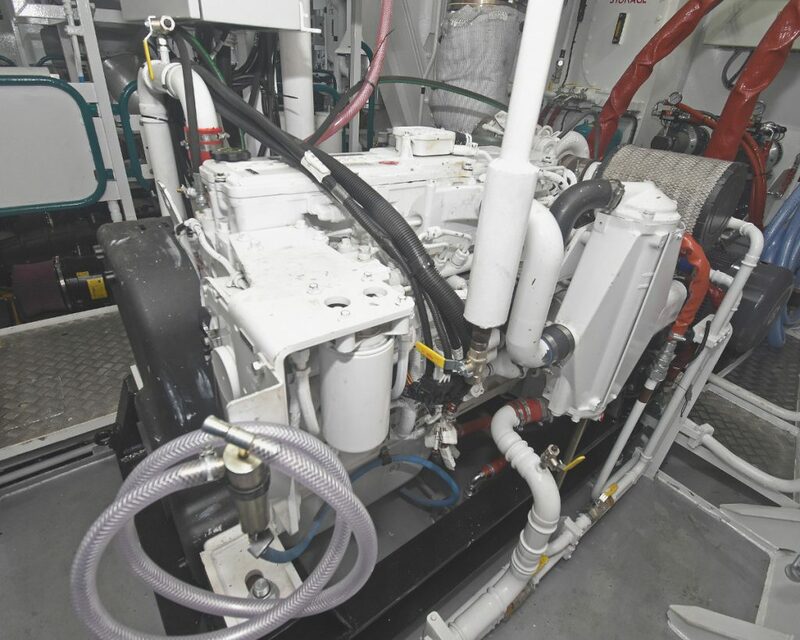 A Cummins QSL9 auxiliary engine (213kW @ 1,800rpm), mounted on the port tank top, powers the deck machinery hydraulics through a JBJ clutched splitter box driving two Kawasaki load-sensing 115kW pumps. 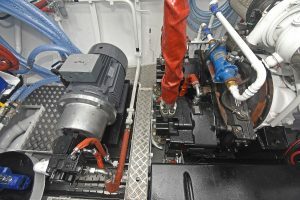 An electrically driven 35kW power pack is used to drive a load-sensing hydraulic towing pump, as well as to provide back-up hydraulic power. 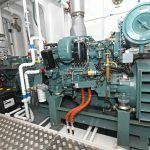 This arrangement also enables the deck machinery to be operated in harbour, when the crew are either mending or taking on gear, while routine maintenance work is carried out on the main engine. 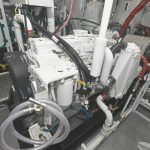 Installation of the vessel’s hydraulic system was completed in-house by Parkol Marine Engineering, with stainless steel being used throughout. 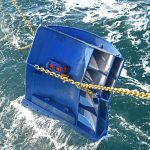 A hydraulically powered Kort bow thruster of 120kW is fitted to give maximum vessel manoeuvrability in restricted areas. 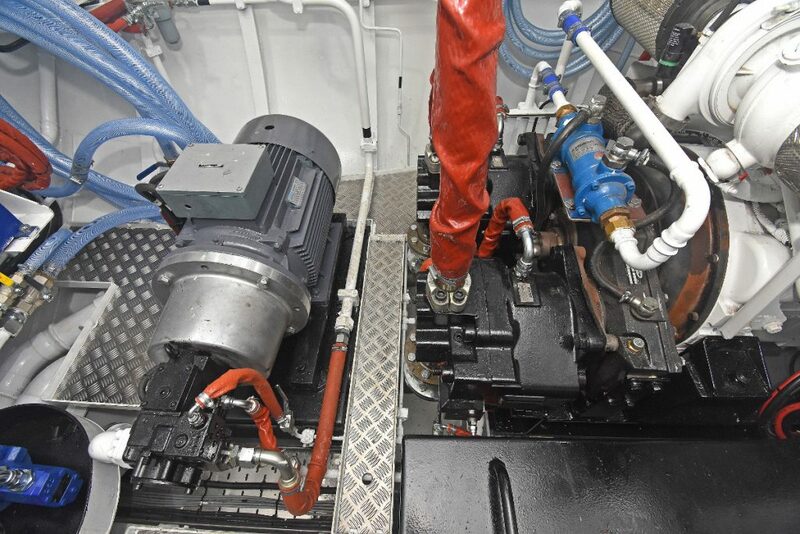 Electrical supplies onboard Uberous are provided by two Mitsubishi 6D16T auxiliary engines of 105kW @ 1,500rpm. 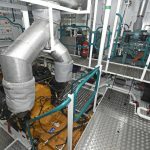 Supplied by Dutch company Padmos, the auxiliaries, which will be run alternately, drive 100ekW 125kVA Newage Stamford 415/3/50 generators. … through two Kawasaki load-sensing hydraulic pumps. Cooling for the four engines and the hydraulics is provided through NRF box coolers, arranged across the forward end of the engineroom. 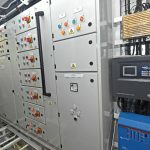 One Victron 80amp charger is fitted to charge the three sets of batteries in the engineroom. 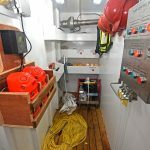 A similar Victron charger is situated in the wheelhouse to serve the lighting batteries, in addition to a 50amp GMDSS charger. 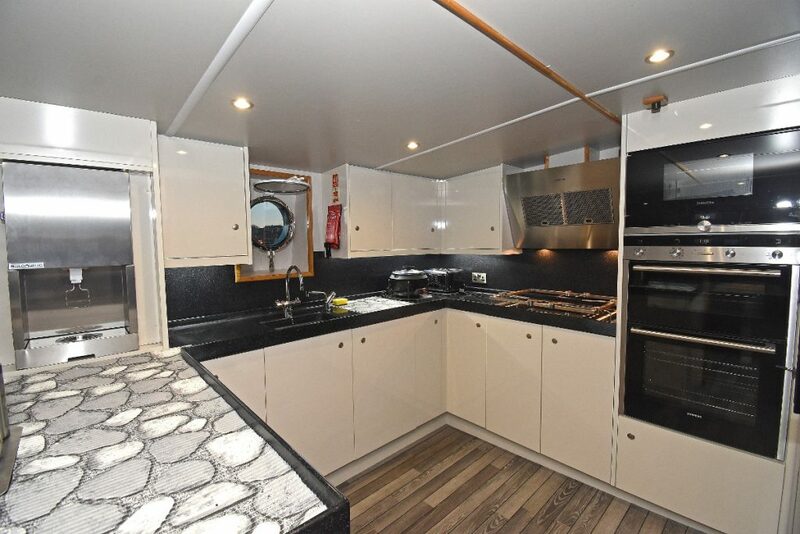 Pearson Electrical of Hull was subcontracted by Parkol Marine Engineering to undertake the electrical installation work on Uberous, alongside the boatyard’s own electricians. 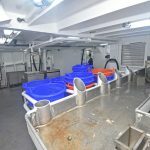 The combination of a 13,500-litre double-bottom twin tank under the fishroom floor and two 4,000-litre wing tanks in the engineroom allow 21,500 litres of fuel to be carried. A forepeak tank holds 19,700 litres of freshwater. 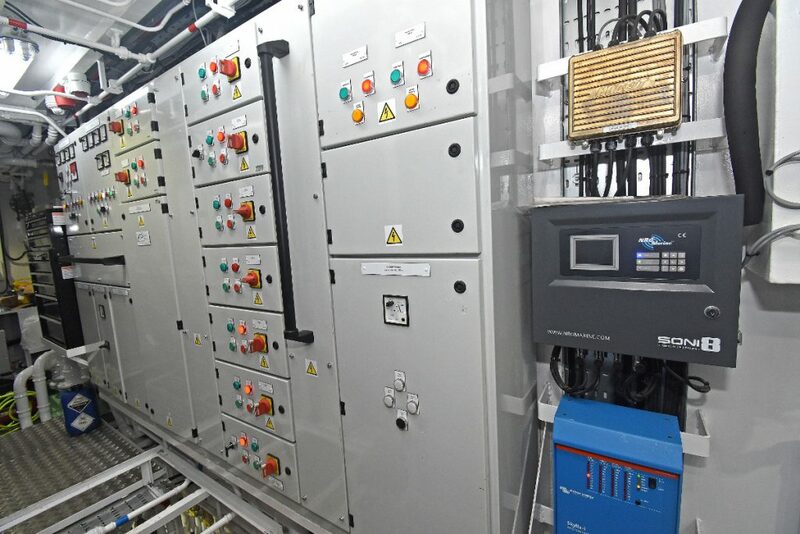 A Sonic 8 hull ultrasonic generator, supplied by NG Marine, is installed in the engineroom, in order to eliminate the regular occurrence of sea chests/sea vales and piping becoming choked with mussels, which in turn reduces the supply of water going to a vessel’s cooling systems and the fishroom refrigeration plant. 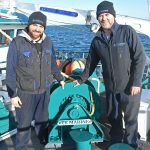 Uberous is equipped with a comprehensive array of electronics equipment that was supplied, installed and commissioned by brothers David and Kevin McMinn of the Fraserburgh-based company McMinn Marine. 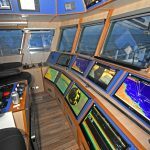 Ten 24in and five 19in Neovo X-series flat screens are flush-mounted in the main and overhead forward consoles, and aft at the trawl console, on which displays are controlled by a HDMI matrix switcher. Another display screen is also positioned at the central desk area in the wheelhouse, for operation of the fish scales/E-log/weather forecasting, and general internet use. 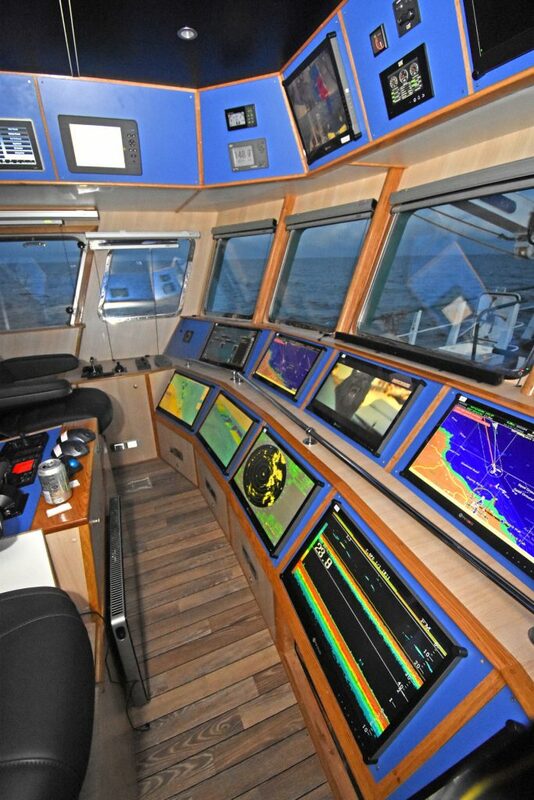 A 50in TV with a four-way split for TV, Scanmar, Sodena plotter and CCTV display is also located on the messdeck. 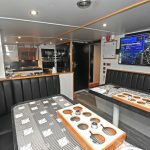 Positioned across the full width of the wheelhouse and terminating in slim wing consoles housing engine and steering controls, the main console is arranged on two levels forward of two NorSap 1600 skipper’s seats that flank a central island console. 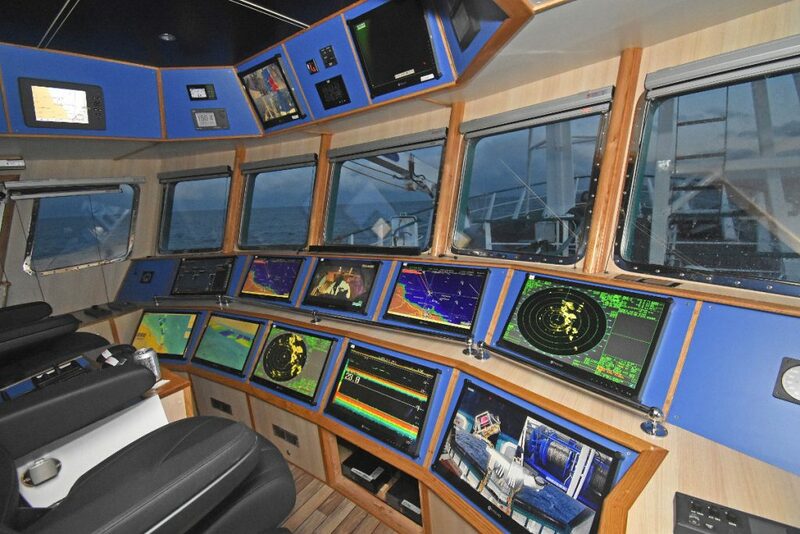 … a comprehensive array of electronic equipment and display screens. 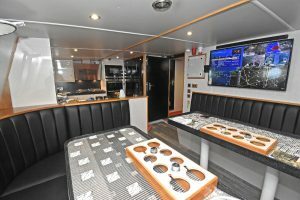 From the fishing console aft, a single wide window gives a commanding view of the doors and clump coming up, aided by comprehensive CCTV displays of activity on the quarter, forward at the winch, and from the top of the aft mast. 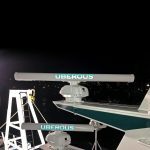 Details of Uberous’ location are processed by two Furuno GP39 GPS receivers, and vessel heading is provided by a JRC JLR21 satellite compass. 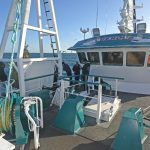 Positioning data received is interfaced to three fishing and navigation plotters – Olex 3D (c/w ground discrimination), and two Sodena Turbowin plotters – supporting a combination of Tide T8 charts, AIS and ARPA tracking. A FishSafe unit is also fitted. 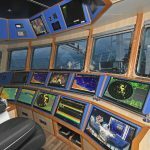 Two Furuno 1513BB 12kW radars, each of which has a personalised scanner displaying the vessel’s name, coupled with a Jotron TR8000 Class A AIS transceiver, provide ARPA and AIS tracking, as well as through the plotters. 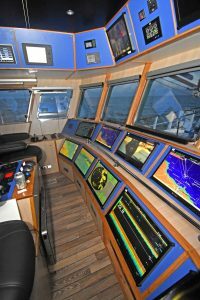 Vessel steering and navigation is taken care of by a Navitron NT 777 digital autopilot c/w a second control head aft, 4 x Navitron tillers, and 3 x indicators. 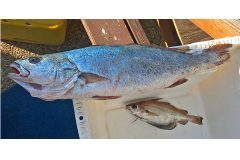 Bottom sounding and fish detection onboard Uberous is provided by a JRC 130BB single-frequency (50kHz) colour sounder, the ground hardness output of which is interfaced to the dual-screen 3D Olex plotting system. Communications equipment includes 2 x JRC 2150 150W DSC radio telephones, 2 x Sailor 6215 VHFs, Icom M323 DSC VHF and Furuno NX Navtex. 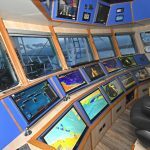 McMinn Marine also installed three CCTV systems, each of which is served by four cameras to provide comprehensive safe working coverage throughout Uberous. An underwater camera focused on the propeller, nozzle and rudder is also fitted. EK Marine of Killybegs manufactured the customised hydraulic deck machinery installed on Uberous. 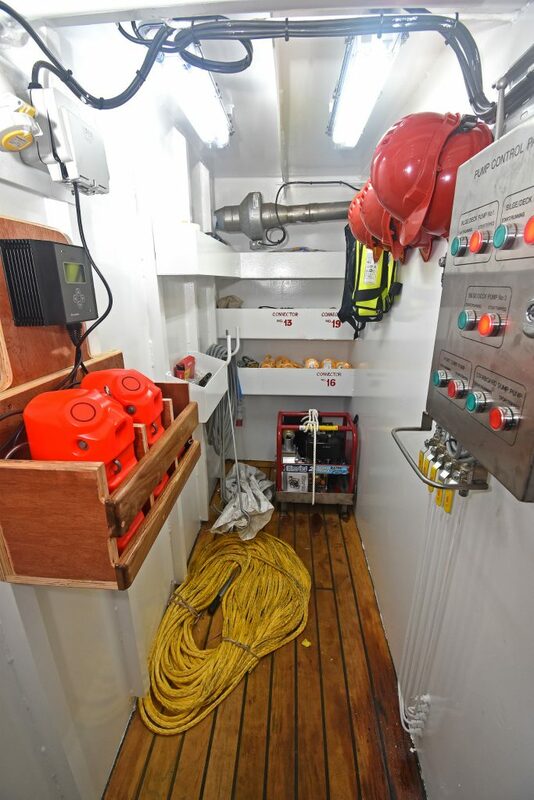 The bespoke package, which also includes load-sensing pumps, was developed in liaison with the owner and yard, to ensure an exact match with the space available and the preferred deck layout and working arrangements. 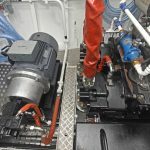 EK Marine supplied a similar array of deck equipment to Daystar less than two years ago, since when the company has provided another three packages to Parkol Marine Engineering for installation on Sparkling Star UL 290, Summer Rose OB 141 and Atlantic Dawn CN 25. … that also included a 7.5t Gilson and a stiff-boom landing crane, which were commissioned by Damian Kennedy and Eunan Kennedy (right) before fishing trials. 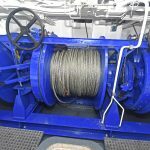 Uberous’ deck machinery includes a three-barrel two-speed trawl winch (35t) with a drum capacity for 750 fathoms of 22mm-diameter wire. The heavy-duty unit was fabricated from special Hardox steel plate to give weight-saving benefits, and fitted with high-specification SKF bearings and Hägglunds compact motors. Similar materials and parts were used in the manufacture of two 2 x 12t split net drums and a 7.5t Gilson winch. 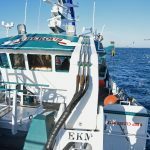 EK Marine also supplied a knuckle-boom powerblock crane (1.5t @ 7m) and a stiff-boom landing crane (1t @ 8m), fitted on the foredeck. On completion of all fabrication work, the deck machinery was shot-blasted and metalised, before being painted with two coats of undercoat and two coats of gloss paint. Skipper Ian Duthie chose a Scanmar twin-rig double-distance monitoring system to provide optimum levels of fishing efficiency, in terms of both gear spread and fuel economy. 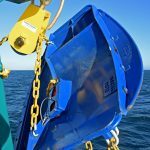 Information supplied by three Scanmar SS4 sensors, operating via the popular ScanMate bridge system, provide constant numerical and graphical updates of the middle clump’s position in relation to the trawl doors. 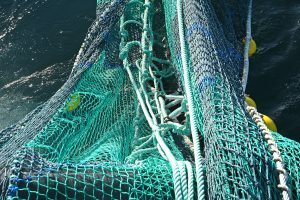 In a fishery where maximising gear spread and symmetrical net geometry is of paramount importance, the information provided enables the position of the middle clump to be adjusted whenever the need arises, by eliminating any doubt from the mind of a skipper as to whether the clump is in line with, in front of, or behind the trawl doors. 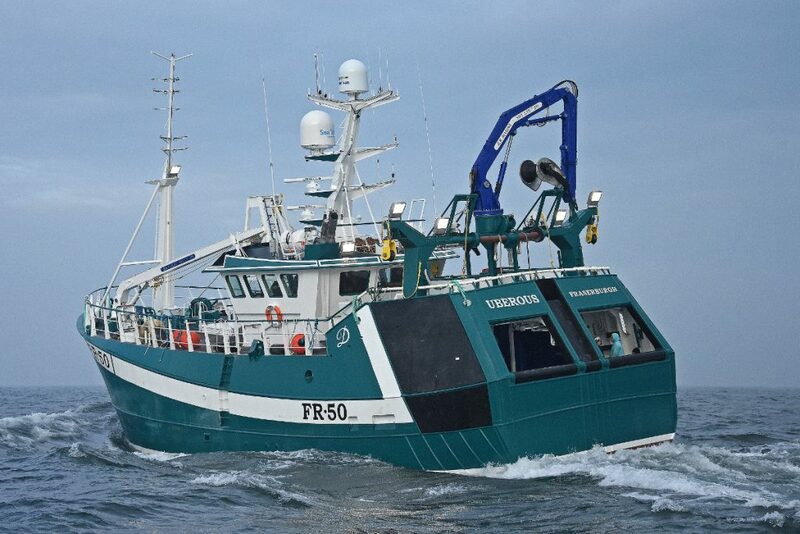 The twin-rig prawn trawls that Uberous is using were custom-built for skipper Ian Duthie by two Fraserburgh companies. 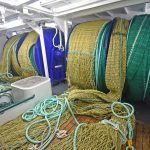 The 200ft lowflyer nets, made by Faithlie Trawl, are fitted with flip-up ropes. 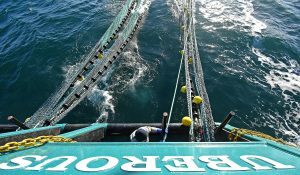 Willie Hepburn and his team at Faithlie Trawl made letterbox-style 200ft low-flyer nets, rigged on 6in and 8in discs. 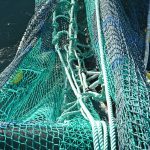 Standing less than 3ft high, this bespoke design of net, which is now widely used by prawn skippers at Fraserburgh and further afield, was developed specifically to minimise unwanted by-catches of whitefish. 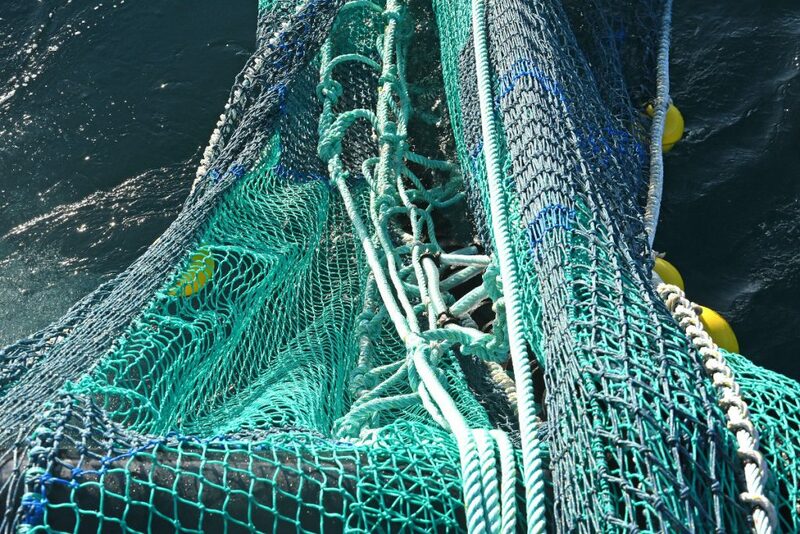 Given that these nets are usually fished in some 75 fathoms of water on the main North Sea prawn grounds, and therefore target less than 0.5% of the water column, this highlights how Scottish fishermen and net-makers continue to lead from the front in Europe with innovative ideas to address landing obligation requirements. 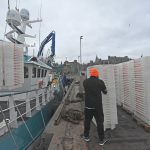 Having been one of the last skippers to take delivery of a set of new twin-rig prawn scraper trawls from Fidelis Nets before Stuart Buchan’s well-deserved retirement – some 20 years after most people begin to step back – Ian Duthie asked Faithlie Trawl to make these unfished nets into 180ft discer nets, by setting them on new ground-gear consisting of larger 8in- and 10in-diameter discs. 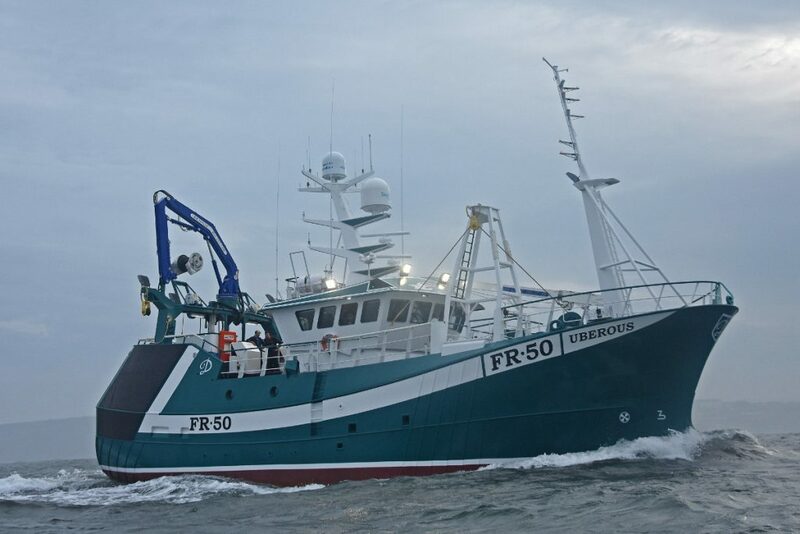 Faithlie Trawl and Fidelis Nets made the low-standing twin-rig prawn trawls Uberous is towing now. 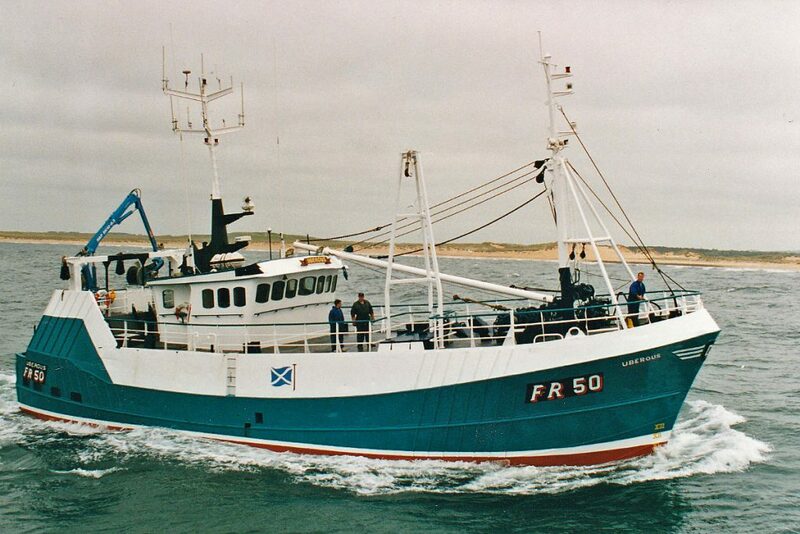 Skipper Ian Duthie has also ordered 2 x 200ft prawn scraper trawls, set on 6in and 8in discs, from Faithlie Trawl. 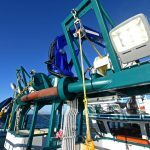 Uberous is using 50 fathoms of 32mm-diameter four-strand combination warp and 10 fathoms of 20mm-diameter wire rubber legs, made by Faithlie Trawl, to connect the twin-rig gear to a 1,000kg roller clump, made by Macduff Shipyards, and a set of Thyborøn Type 11 72in 600kg trawl doors. 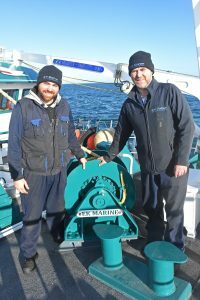 The 3 x 250 fathoms of 22mm-diameter compact fibre-core trawl wire, spooled on the barrels of the three-drum trawl winch on top of 50 fathoms of backing wire, came from Karl Thomson of Buckie. 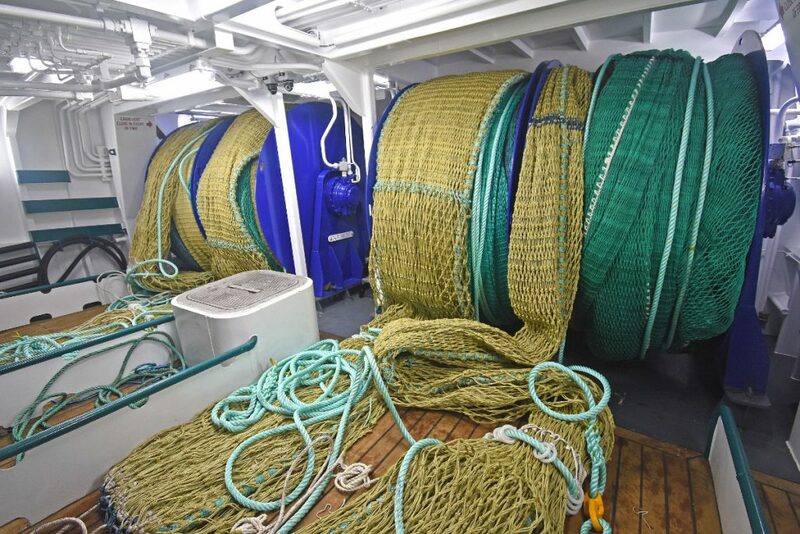 The chain and connectors that skipper Ian Duthie and his crew used to rig out Uberous, together with some blocks, came from Strachan Trawls of Fraserburgh, while Caley Fisheries supplied the Dyneema rope used for the landing crane and the hanging blocks, as well as the fenders. The first Uberous FR 50 was built by J&G Forbes of Sandhaven in 1969. 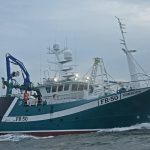 Meaning ‘an abundance of fruit’, Uberous FR 50 is the third new boat of that name built for Ian Duthie’s family, and the fourth Uberous his father Charles Duthie has been associated with in the past 45 years. 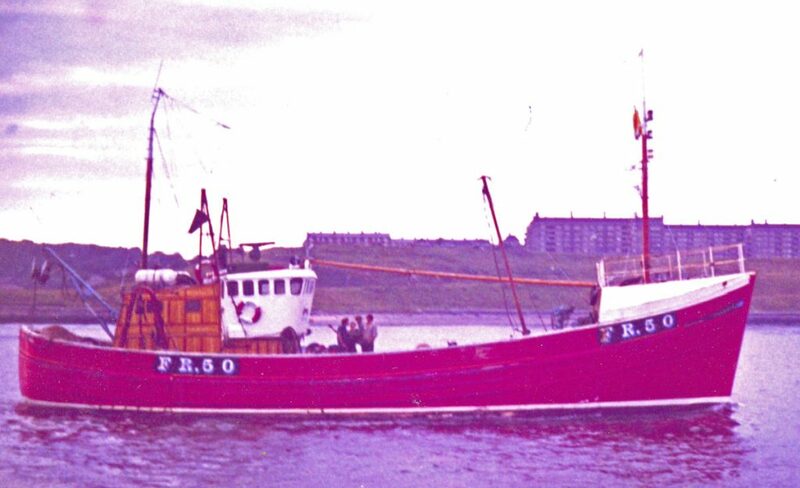 J&G Forbes of Sandhaven delivered the first Uberous FR 50 in 1969 to Charles Duthie and his brother, skipper Ian Duthie. 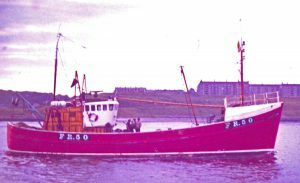 This was a traditional style of 78ft wooden-hulled and Cat 450hp-engined seiner, which in later years also pair-trawled for herring. 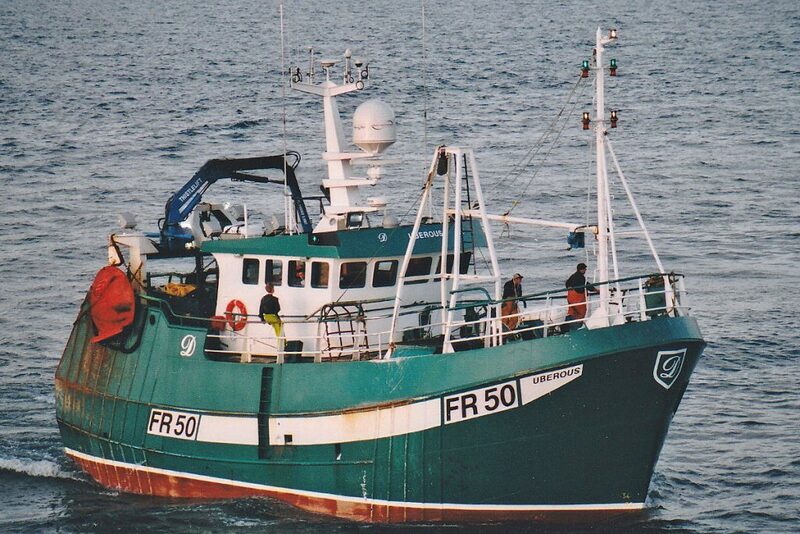 The second Uberous, after being converted to twin-rig trawling in 1998. 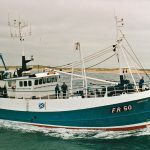 When Ian Duthie bought the 86ft steel-hulled Andrea PD 161, built in Berwick in 1975, and renamed her Modulous FR 272, Charles Duthie skippered Uberous, before buying the purser Comrade BA 422 from Forbes Cameron of Ayr in 1982, in exchange for the wooden-hulled Uberous, which later caught fire and sank off the Ailsa Craig. 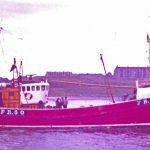 Built in Holland in 1973 as Comrade FR 122 for Fraserburgh skipper Andrew Tait, the 88ft vessel was renamed Uberous and used for a combination of pelagic and whitefish trawling by Charles Duthie, always partnering his brother Ian’s Modulous. 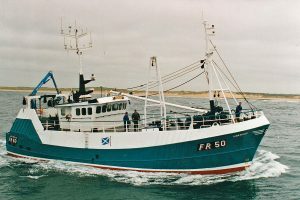 Macduff Shipyards built the third Uberous for Ian and Charles Duthie in 2005. 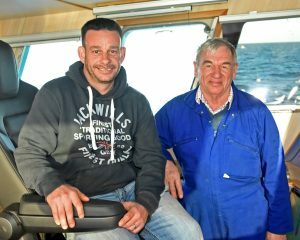 Increasing changes in the pelagic sector resulted in Charles and his son Ian Duthie taking the decision in 1998 to convert Uberous to twin-rig trawling. Macduff Shipyards completed the major refurbishment work, which included extending the deckshelter to the transom and removing the RSW tanks. 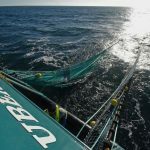 Uberous subsequently worked twin-rig gear for five years, before the father and son team decided that the most viable way of continuing their family’s long fishing tradition would be to downsize their operation by going for a purpose-built prawn twin-rig trawler. 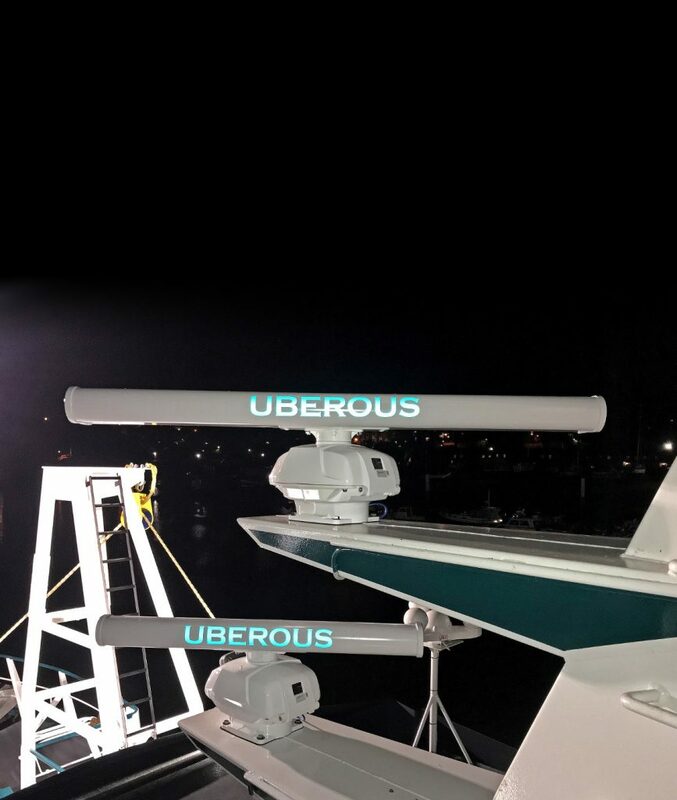 After Uberous was broken up in Denmark, the owners weighed up their options before deciding which size and style of boat to choose. 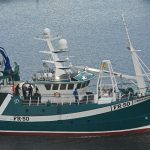 The outcome was the 18.6m twin-rig trawler Uberous, delivered by Macduff Shipyards in 2005, since which time the Caterpillar 3412-engined boat performed consistently well, fishing prawns from Fraserburgh. 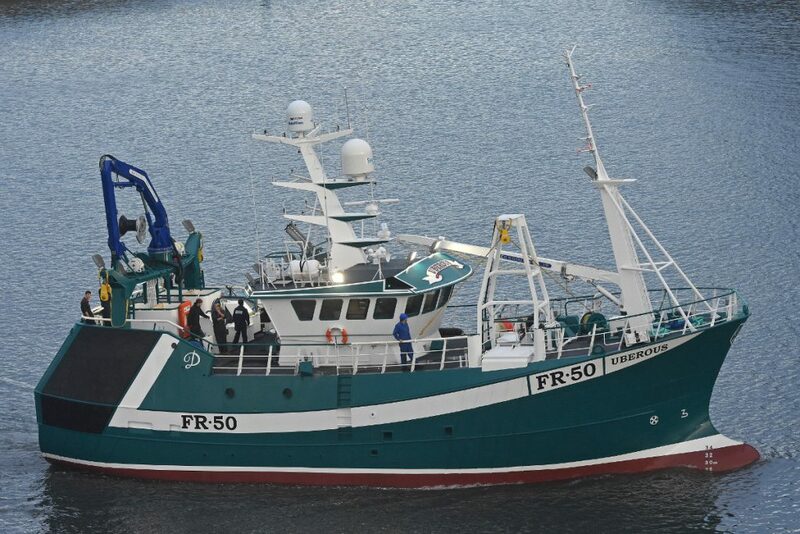 This boat was recently renamed Zephyr BF 601, after being bought by Mark Robertson of Gardenstown, together with his sons and fellow skippers Adam and Paul Robertson. Zephyr joins her near-sistership Zenith BF 106 (ex-Daystar BF 151), which the Gardenstown family bought 18 months ago, shortly after Parkol completed the new Daystar for skipper Steven West.